Jett had Duchenne muscular dystrophy (DMD), a muscle-wasting disease for which there is no cure. DMD, one of nine types of muscular dystrophy, is the most common and lethal genetic disorder in children, affecting about one in every 3,500 male infants. Boys diagnosed with DMD—and almost all DMD patients are boys—tend to decline rapidly, their muscles progressively and irreversibly weakening. Typically, they are confined to a wheelchair by age 12, continue to lose muscle function through their teens and die of heart or respiratory failure in their twenties. But today, 16 years after his diagnosis, Jett McSherry is defying the odds. It’s true that he hasn’t taken a step since the age of 13, but at 21, his decline has now leveled off and he even shows signs of an upswing. Jett just finished his sophomore year at Bridgewater State University, where he lives on campus with a roommate. When he’s at his family’s home in nearby Pembroke, Mass., he can bend down from his electric scooter to pat the family dog and then sit back upright unaided—something unimaginable just a few years ago. He has regained limited use of his hands as well—while hanging out with his older brother recently, he managed to open a beer. “He’s never opened a bottle or a can in his life,” his mom marveled. What exactly changed? Jett still has DMD, of course. Because the disease is caused by a flaw in his genetic code that renders his body unable to produce an essential muscle-protecting protein, his independence and mobility remain limited. He still faces a shortened life-span. But for the past two years Jett has been taking a new drug called eteplirsen, which spurs his body to produce that missing protein, slowing the progress of DMD. The drug—marketed as Exondys 51 by the Massachusetts-based company Sarepta Therapeutics— is not a cure, but it’s a start. Christine McSherry and her son, Jett, who is taking the newly approved drug Exondys 51 for his Duchenne muscular dystrophy. Before scientists could figure out a way to treat DMD, however, they had to find the one gene responsible for it among tens of thousands of them. The road to that discovery runs back to the early 1980s, two decades before the completion of the Human Genome Project, at a time when much about inherited diseases such as DMD seemed an impenetrable mystery. The attempt to identify the DMD gene struck many experts as destined to end in failure. But at Harvard Medical School, a pioneering geneticist named Louis Kunkel and his first graduate student, Anthony P. Monaco, a bright young researcher just out of Princeton, were about to take up the challenge. In time, they would make history. In 1983, the field of molecular genetics was in its infancy. That year, James Watson—who had won a 1962 Nobel Prize for helping unravel the double-helix structure of DNA—oversaw a conference at Cold Spring Harbor Laboratory in New York. Attendees batted around some of the new field’s most fundamental questions: What does a gene do, exactly? How would you go about looking for a one? At one point, after hours of discussion, a scientist stood up and asked, “You know, we’ve never seen a gene before. How will we know if we find it?” That question stumped everybody. 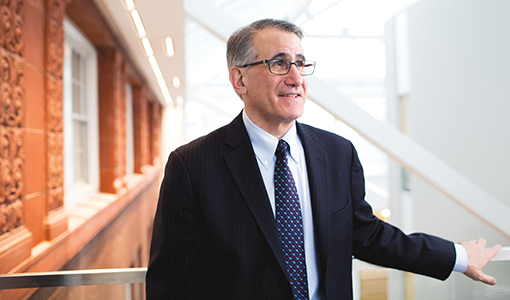 More than 200 miles away, at Boston Children’s Hospital and Harvard Medical School in Boston, Louis Kunkel was already hard at work finding answers. Not long before the Cold Spring conference, he delivered a lecture in Harvard’s neuroscience of disease course. During the next phase of his research, he announced to his students, he wanted to identify the genetic defect that caused Duchenne muscular dystrophy. It didn’t matter to Kunkel that Monaco had no lab experience in genetics or molecular biology. “I could see that he was smart, interested in the problem and willing to work,” Kunkel said. And they had lots of work to do. They believed that DMD was the result of missing pieces, or deletions, in the DNA, and they knew that these deletions were somewhere on the X chromosome, but everything else was a mystery. To find the genetic flaw behind DMD, Monaco became an expert in a new research method called “positional cloning,” which involves comparing vast quantities of DNA drawn from patients to find the specific site of the gene mutations causing their health problems. Monaco collected DNA samples from 55 or so DMD patients to study how they differed from those of healthy subjects. The more differences the team could chart, went the reasoning, the more detailed they could make their map to the DMD gene. The work was slow, and the Kunkel lab had competition. Other researchers, including groups based in Oxford, Leiden and Toronto, were unusually cooperative in terms of sharing resources and information, but were also working furiously to be the first to identify the DMD gene. “It was a footrace, and I didn’t look back,” Monaco recalled. He often worked straight through the weekends, yet still made time each week to visit young DMD patients and their families in the muscular dystrophy clinic at Boston Children’s Hospital. Using what are known as “zoo blots,” Monaco compared his samples of human DNA to samples from hamsters, monkeys, cows and other animals. Finally, one day in May 1986, more than three years into the search, everything snapped into focus: Some of the DNA on a zoo blot Monaco and Kunkel were reviewing—from a mouse and a chicken, as it turned out—matched up well with the lab’s fragments of human genetic code. Found among millions of letters of DNA, this was the X that marked the spot on the map Monaco was drawing—the exact location of a piece of the DMD gene. The discovery of where to look for the genetic flaw that causes DMD represented a great leap forward in diagnosing the disease in children, one that led to an in-utero scan with 80-percent accuracy. But the scientists in the Kunkel lab still lacked fundamental information about the disease, including exactly which muscle-protecting protein the damaged gene was failing to produce. Without that knowledge, their basic research, regardless of how groundbreaking, could never point the way to a treatment. 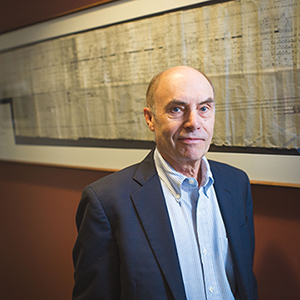 Harvard geneticist Louis Kunkel at Boston Children’s Hospital, where Anthony P. Monaco’s drawing hangs on the wall as a reminder of their historic search. So the Kunkel lab began looking for the protein. In 1987, nearly a year into the search, a postdoc in Kunkel’s lab named Eric Hoffman at last found it. (Hoffman today is a dean for research in the School of Pharmacy at SUNY/Binghamton University.) The lab called the protein dystrophin. Now, the researchers could turn their attention to comparing three different sets of genetic code. The first was from healthy people who produced normal amounts of dystrophin. The next was from DMD patients, who couldn’t produce any dystrophin at all. The final set was from patients with the less severe Becker disease, who produce limited dystrophin. The team wanted to figure out how differences in the genetic code resulted in varying levels of dystrophin production and severity of the disease. The researchers knew that the body’s instructions for creating dystrophin come arranged in three-letter sets of DNA, which are located in parts of genes called exons. To get a sense of how it works, imagine that, in a healthy person, exons are strung together along the gene to create the sentence “Run mad cat eat the big bat.” That instruction directs the person’s cells to produce a normal amount of dystrophin. In a DMD patient, however, exons are deleted and rejoined such that the “cat” three-letter code might be missing the “c” and the “a,” a deletion that shifts all the other letters in the sentence, resulting in “Run mad tea tth ebi gba t.” The cells can’t read that garbled instruction, so the person can’t produce dystrophin. When it came to the genetic code of a Becker patient, however, Monaco found something curious. In those genetic codes, entire exons had been deleted and rejoined without disrupting the reading frame of the three-letter codes, leading to such sentences as “Run mad cat eat bat.” The dystrophin instruction was shorter than in a healthy subject, yet still readable. As a result, Becker patients produce some dystrophin, but less than a healthy person. And some dystrophin, it turned out, was far better than none. People with Becker experience much less muscle wasting than those with DMD, and can expect to live decades longer. When comparing the two forms of muscular dystrophy, Kunkel and Monaco had a revelation: There might be a way to trick the cells of DMD patients into skipping over deleted exons and continuing on to read the rest of the genetic instruction—like a boy hopping over a crack in the sidewalk and continuing on his way. If this turned out to be possible, a body that was producing no dystrophin could be spurred to produce at least some. The implications were staggering. “At one point,” Monaco recalled, “Lou and I looked at each other and said, ‘You could turn a Duchenne patient into a Becker!’” In 1988, Monaco and Kunkel published a paper on their breakthrough understanding of the reading-frame differences between Duchenne and Becker patients, but the exon-skipping idea was still just a theory. Close to a decade later, when the Australian scientist Steve Wilton started formulating the drug that would become Exondys 51, he called the work of his predecessors “pivotal” in developing the treatment. In September 2016, the FDA saw enough promise in Exondys 51 to grant it accelerated approval, overriding its own advisory committee that had voted 7-6 against approval on grounds that the original 12-person study was not adequately controlled. Sarepta Therapeutics can now market the drug, but must conduct additional research to confirm its efficacy. If the results aren’t convincing, it could be taken off the market. (Meanwhile, some insurers are refusing to cover it.) Sarepta is also working on drugs that would skip both Exon 45 and Exon 53; each affects about 8 percent of DMD patients. Other companies are exploring additional treatments. For now, though, Exondys 51 works just as Kunkel and Monaco imagined that it might 30 years ago: by causing cells to skip over missing exons, thereby enabling the production of dystrophin that hadn’t been there before. In other words, by turning a Duchenne patient into a Becker. Anthony Monaco, of course, went on to become the 13th president of Tufts University. Before that he spent 20 years at Oxford University, immersed in genetics research and writing or co-writing more than 300 publications, many of them landmarks in the field. In 1995, he cofounded Oxford’s Wellcome Trust Centre for Human Genetics, now the UK’s largest externally funded, university-based research center, and served as its director for close to a decade. “He’s one of the most accomplished geneticists of his generation,” Kunkel said of his former student. “Tony has identified by positional cloning more genetic disorders than anybody else, notably in the areas of deafness, autism and certain speech problems.” And all these years later, the framed six-foot-long drawing Monaco made of DMD genetic code now hangs at Kunkel’s office in Boston Children’s Hospital. Even for a basic researcher as accomplished as Monaco, it is rare to see the good your work can do out in the world. A willingness to endure high failure rates and years of toil in the lab is often what is required to eventually solve the big medical mysteries and pave the way for transformative treatments. Monaco knows this as well as anyone. And yet, earlier this year, Monaco got just such an opportunity—the chance to draw a line from his long-ago work at Harvard to the present day. In February, he met with Christine McSherry, Jett’s mother, in Ballou Hall. 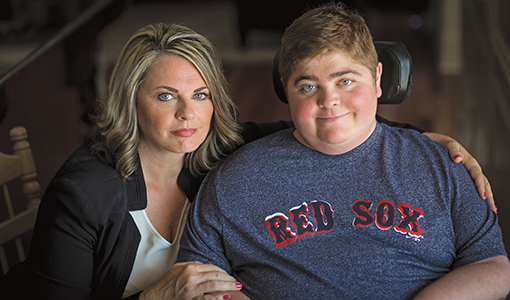 McSherry, a former registered nurse at Tufts-New England Medical Center (now Tufts Medical Center), launched the Jett Foundation shortly after her son’s diagnosis. The nonprofit has raised some $18 million to date and helps guide families through their insurance appeals (McSherry’s insurer has agreed to cover Jett’s treatment through April 2018), funds DMD summer camps and builds social networks among DMD families. McSherry has also traveled the world consulting with experts and testifying about the disease. On this day, though, she just wanted to tell Monaco about the difference his research has made in the life of her son. Whatever its limitations, Exondys 51 has been life-changing for McSherry’s family. She described for Monaco all the improvements she’d seen in Jett. He’d regained some limited movement, including in his hands, and he’d even been breathing better. When McSherry rose to leave, she gripped Monaco’s hand. “Thank you for the great work that you did,” she said. Monaco told her how happy he was to have done it. Bruce Morgan is the former editor of Tufts Medicine.